Glaucoma, condition of increased pressure in the eye ball, which lead to damage to the optic nerve. It is possible to deal with this disease through medications such as eye drops, and if not benefited drugs could resort to surgery. High pressure in the eye because of the accumulation of watery fluid inside the eye, leading to high intraocular pressure, and thus damage to the optic nerve tissue. Laser surgery is now popular though the long-term success rates. The most common type performed for open-angle glaucoma is called trabeculoplasty. 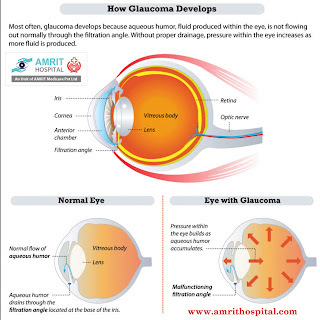 Amrit Hospital provides Glaucoma Treatment In Chennai.